Big news! ARIEL receives $40,000 grant from the Harden Foundation! The Harden Foundation has once again shown their support for ARIEL Theatrical in a big way. In addition to a $5,000 technology upgrade grant, ARIEL will receive dollar-for-dollar matching funds for all donations up to $35,000. As a non-profit that has invested in the young people of Monterey County for more than 30 years, ARIEL understands how providing positive activities for youth and encouraging principle-centered living helps to strengthen communities. An investment in ARIEL is an investment in the young people who are learning how to incorporate Accountability, Respect, Integrity, Excellence and Leadership into their every-day lives long after the curtain closes and the applause is over. Donations are accepted online, over the phone by calling 831-775-0976 or in person at The Karen Wilson Children’s Theatre at 320 Main Street, Salinas. The Hunchback of Notre Dame opens in August at ARIEL Theatrical! Travel to medieval Paris without leaving Salinas! A brand new musical, based on Victor Hugo’s The Hunchback of Notre Dame, will transform the ARIEL stage into the legendary cathedral that serves as the backdrop for this powerful story. The Gothic arches loom as the drama unfolds in this epic musical adventure. Showcasing the award-winning score from the Disney animated movie, the on-stage choir and cast of characters, including the hunchback, Quasimodo, will lead the audience through the streets of Paris and into the maze of human emotion as the conflict between light and darkness rages on. All performances take place at The Karen Wilson Children’s Theatre, 320 Main Street, Salinas, home of ARIEL Theatrical. Performances are on Fridays and Saturdays at 7 pm, August 3 – 18, 2018. Tickets are available online (www.arieltheatrical.org) over the phone (831-775-0976) or in the ARIEL Box Office. Located in the heart of Salinas City Center, ARIEL Theatrical provides opportunities for children to explore the stage and learn valuable lessons about Accountability, Respect, Integrity, Excellence and Leadership. ARIEL’s finest productions are not the plays but the responsible young people who come together in a positive, collaborative spirit to learn, perform and share experiences that they will carry with them for a lifetime. ARIEL is grateful to our 2018 Season Sponsors, Aladin Properties, Cardinale Moving and Storage and Central Coast Cleaning. Also, a big “thank you” to our summer and show sponsors, 1st Capital Bank, A&R Fresh, Hastie Financial Group, Silva Farms and Valley Exxon. For more information, visit ARIEL in the Karen Wilson Children’s Theatre, 320 Main Street, online at www.arieltheatrical.org or call 831-775-0976. 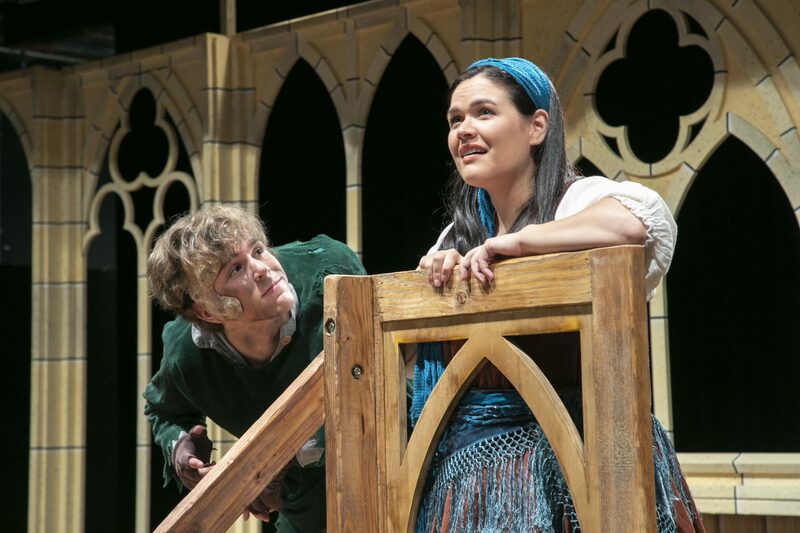 From his bell tower, Quasimodo (William Van Nes) shows the Gyspy Esmeralda (Sylvia Figueroa) the streets of Paris in ARIEL Theatrical’s production of The Hunchback of Notre Dame on August 3, 4, 10, 11, 17 & 18 at the Karen Wilson Children’s Theatre, home of ARIEL Theatrical, 320 Main Street, Salinas. Photo Credit: Richard Green.